Project GoldiLocks: MISSION IMPOSSIBLE or JUST RIGHT? In hindsight we should have started blogging about this over two years ago when we made the decision to make the transition from sail to voyaging under power as we have so much to catch up on now. Some would call this “going over to the dark side” though we have never thought of it that way, and to make matters worse/better soon thereafter we decided to design and build a new boat. This would likely result in a consensus amongst most family and friends that we have truly lost our minds this time, but that’s also not the way we see it nor is it anything new for them or us. · some postings will go back in time to chronicle the design process that began aboard our previous home, a 52-foot steel sailboat s/v Learnativity, on our three-week passage from Majuro in the Marshall Islands down to Fiji at the end of April 2015. · yet other postings will look ahead as we work through decisions needed for next stages of the build. · and some postings won’t be time oriented at all as we outline and discuss our thinking on how best to do things or explain the why’s of what we are doing. Most importantly though we would like to have YOU to join us as fellow collaborators on Project Goldilocks aka MV Möbius with your comments, suggestions and questions all along the way. This posting is intended to provide you with the big picture overview of Project Goldilocks or PGL by outlining the high-level requirements we developed to guide us through the design phase of the project and now through the build process. These will progress from the very top level “mission statement” down through successive expanding layers providing more context of our use case and then the key attributes we want to have in our new boat. All of this comes as a reflection and culmination of our collective experiences on other boats we’ve sailed and lived aboard during our many passages and adventures throughout the world. Christine has been boating most of her life and as she recently commented to me “dangerously approaching 50 years of sailing now”. I on the other hand didn’t start sailing and messing with boats till I was in my 50’s and I’m still not sure to this day just what prompted this as I had no previous marine orientation to my life nor any in my family. However, curiosity and learning have most often been the drivers in my life so once I became curious I jumped in with both feet and have now been sailing full time for the past 11 years. Christine has done everything from building two 54’ sailboats with her first husband Jim and subsequently sailing and chartering one of these for almost 15years including raising their son onboard for most of these. My experiences have mostly been single handed sailing my 52’ steel cutter from Victoria BC down the west coasts of North, Central and South America and then meandering west for many years through the Pacific. So, we have ended up with about the same number of nautical smiles under our respective “bottoms” and just over 100 thousand nm in total. Our prior experiences have almost all been under sail and so part of what is calling our name to try voyaging under power was that it would provide us with a whole set of new challenges and adventures and adventures are what we live for. Our intent when we started this process over three years ago was and is still, to distill our collective experiences and preferences into a set of clearly stated high level goals and objectives to guide us throughout the whole design and build process such that at any time we could stand back from the process and use these overarching statements to check that we were keeping our priorities straight and still on target. It has served us very well throughout the design phase and will do even more as we now go through the build phase of executing all these design decisions. We spent countless hours over those many first months and now years, thinking this through individually and discussing our goals between ourselves as well as other sailing friends. We kept working at synthesizing and articulating what we wanted to achieve with the new boat, what our top-level priorities were and the key attributes and characteristics this boat would need to have to be just the right, just for us Goldilocks boat. It should be noted that we are NOT striving for perfection when we talk about getting this boat “just right”. Rather it is about finding the just right fit for us. A boat that we love a bit more every time we swim up to her in an anchorage. A boat we have unconditional confidence in when at sea and the poop hits the fan at O Dark Thirty as it so often does. A boat that inspires and invites us to go when someplace new is calling our name and yet is so comfy at anchor we never want to leave. You get the idea. We are setting out to design and build the just right, just for us boat. These design goals are shaped like a pyramid with the singular mission up at the top and then expanding out with the more detailed levels below. At the very top we worked to articulate what might be called our “mission statement” though that sounds much too formal to us, which was our way of boiling everything down to the very essence of what we were setting out to achieve. Then cascading from this, the more detailed and itemized essential characteristics and requirements we were setting for ourselves and for those we would be enlisting their skills and expertise to collaborate with us on the design and building of Möbius. If you’ve ever tried to create such all-encompassing “mission statements” you know how difficult they are to do well as you try to condense it all down into as few as words as possible. and this still seems to sum it up well. To design and build an exceptional long range Passagemaker that is strong, safe, fast, fun and efficient, serving as our full time home along with the infrequent guests who join us on expeditions exploring the most remote locations of the world in exceptional safety and comfort. It is just the two of us 99% of the time and we are not “camping”, this is our full time home. Our floating home will be optimized to be a “couple’s boat”, primarily for just the two of us and then very inviting and comfy to grandkids, friends’ family to come join us occasionally as well as having another couple or two we meet along the way over for a meal and sundowners. Christine revels in being a best-selling author with no interest in retiring and needs the just right space for writing her future thrillers and running her book business. We will design her onboard office in such a way that it converts into a very comfy Guest Cabin and will have its own shower and head, but priority is to be that Goldilocks work environment that inspires and motivates her. Minimizing distractions is a key factor here so keeping it extremely quiet and absent of any interruptions or distractions of views out picture windows, or dirty Mr. FixIt moving about, will be the priority. Whenever she wants there are plenty of spaces up above for views, breezes and company. Wayne’s work/play is more to do with making and fixing things. This requires a well-equipped workshop with the tools and equipment enabling him to work with his hands making and fixing things. Thus, Wayne’s Workshop will be required to accommodate the many tools, workbenches, equipment and machines for working in wood, metal and mechanics such as lathe, milling machine, welders CNC router, 3D printer, etc. We love being at sea and answering the call of long distant destinations so long passages are the norm for us. Creating a boat that inspires confidence to GO anytime whenever the sea or other locations call and to be snug and safe on long passages getting there is a primary requirement. We were both single handed sailors for many years and have come to appreciate the high value of having a boat that can be single handed safely in all conditions if the need should arise. We have had the most previous experience in tropical settings and love this climate. We often talk about our “20/20 Rule” of staying within 20 degrees of the equator. We like heat and we can tolerate humidity up to a relatively high point and intend to explore explore new tropical areas as well as going back to some many that we have enjoyed previously. However high latitude areas have been calling our name more and more, areas that are predominantly cold and would involve motoring through high winds, rough seas, freezing temperatures and ice invested waters. We are equally drawn to slightly less extreme locations a bit closer to the equator but still cold to us such as going up the inside passage of Vancouver Island and Haida Gwaii islands in my native British Columbia, and Greenland, Iceland and Norway. We want the new boat, and us, to thrive in all the above locations, climates and conditions. Anytime we are not on a passage we are on anchor and often for extended times of weeks or months with no desire to be in marinas. We put extremely high value on our privacy in this context and like to either be “the only boat in the bay” or otherwise off by ourselves. This necessitates super comfy living spaces, independent self-sufficiency and SWAN ground tackle enabling us to anchor out in deeper waters and Sleep Well At Night. Given our remote, deep and isolated anchorages and our love of exploring ashore we will need a tender that enables us to think nothing of heading to long distant shores without a worry for weather changes to get back, adventuring out for even overnight trips on the tender up rivers and inlets in to suit, and staying safe and dry throughout. Our passion for remote locations puts a premium on being extremely self-sufficient and self-reliant. We prefer small or no populations ashore, so we set our shore side expectations and dependencies as close to zero as possible. We assume zero availability to shore transportation, shipping, shopping or services. This prioritizes great food preservation, water and electrical independence, plentiful spare parts, ultra-reliable systems, lots of storage, repair capabilities and communications. No uninvited guests! Our remoteness, both at anchor and underway sometimes puts us near potential danger from others who would like to “board and borrow” anything from items on the boat to the whole boat and ourselves. We therefore like to have deterrents built into the boat’s design such that we do not look like an inviting nor easy target for those who might be sizing us up. There will be times when we want to leave the boat unattended for anything from extended multi day trips on the Tender to month or more trips back to see grandchildren and family when they can’t come to us. So, we need a boat which we can easily and quickly (several hours) lock up and safely leave knowing she will be fine and require no assistance. This includes leaving the boat at anchor as well as leaving her ashore on the hard or in the water. A lean/mean military “don’t mess with me” look will help with this. Moving down to the next broader level in this pyramid, we had some very specific attributes we knew we wanted the new boat to have. These are all gleaned from our lessons learned from our extensive number of experiences and years living and sailing. Retaining the theme of a “collaborative work of art and engineering” we think of these attributes like an artist’s set of colours or an engineer’s tools in that they are not the painting or design itself but rather what will be used to create the end result. With all the nautical miles under our bottoms and nights at anchor around the world, we had a good sense of what we wanted, some very general and broad, others quite specific. However, we also wanted to start with a blank canvas and create a boat that was not defined by past notions and traditions, ours or others, but rather shaped by these key attributes. It is challenging to come up with the best words and concepts to group or categorize things under and we no doubt stretch the traditional definitions of many of these here. There is also some overlap between several groups, but the following list is what we came up with in the end and still use today. · Anchorage times, measured in weeks and months not days. · Beam with wave piercing style bow for maximum “silent and slippery” wave piercing and minimal wave/wake making. · Physical appearance being long and low in the water with low house and superstructure above decks. · Visual appearance on the water, long, low, lean and mean. · Displacement by saving weight where possible and spending where wise. · Matching her/our purpose and mission. 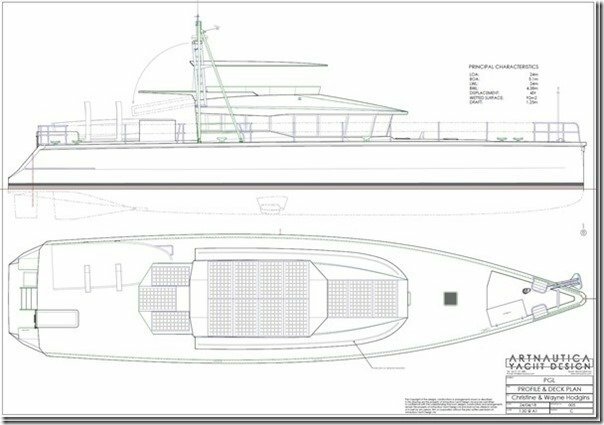 · The UN Yacht: unpainted aluminium, no stainless, no wood, no extras. · Strong Industrial/commercial quasi-military “vibe” partly by a design that is long, low, lean and mean” and partly through the use of very high functionality very low maintenance exterior items such as all unpainted aluminum hull and superstructure, beefy aluminum rub rails and booms and other functional “all business” meant to be used features reminiscent of modern pilot boats, tug boats and commercial fish boats than a “yacht”. · Economic to build: Maximized use of 3D CAD modeling, CAM and CNC for all construction, exterior and interior materials (aluminum, wood, fabrics, etc. · Economic to maintain; Careful selection of materials, equipment and installation to minimize maintenance and failures. · Economic to operate: Maximum efficiency throughout. 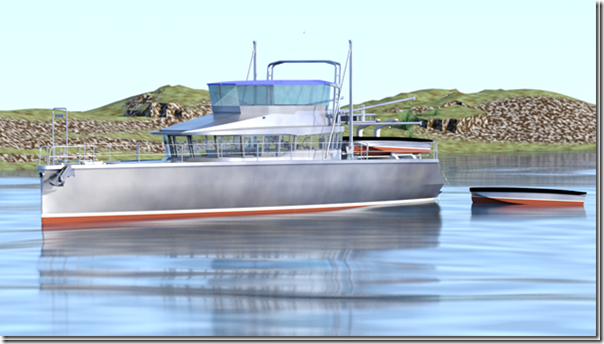 · in all regards; hull, engine, propulsion, electrical as well efficiency in use. · On passage first and anchor second. · Integral tanks below WL for maximum fuel and counterbalancing water. · Self-righting; Maximum positive stability to “survive and thrive” a capsize. All our past boats were sailboats which are inherently self-righting, and we were not willing to give this up with this transition to voyaging under power. · At sea first and foremost, in all weather conditions. Passive stabilization with active designed into hull but not installed at launch. · “Thermos” hull; Cool in hot climates, warm in cold climates. · QUIET: weather, mechanical systems, humans, insulation, vibration. WHERE DID THIS LEAD US? It has already been almost a 3-year process for just the design phase, but we could not be happier with the end result which is a result of finding a great designer, thank you Dennis and then disciplining ourselves to follow the guiding principles and attributes you’ve just read through above. Ultimately our process evolved the design that is now the finalized model of Möbius with the following set of statistics. Some of these numbers are of course theoretical estimates at this time such as cruising speed, range, etc. and we won’t know the real numbers until we launch and have real data from initial sea trials and then ongoing use of the boat, but with the amount of detail we have in the 3D models and the amazing power of the algorithms that can be run on this model, these numbers should be quite close. Hoses, Hinges and Hatches, Oh My! Hatches, Railings & Wire Trays Oh My! John Poparad on Hoses, Hinges and Hatches, Oh My! Orville Harmison on Hoses, Hinges and Hatches, Oh My! Wayne on Holey Hatches Batman! John Poparad on Holey Hatches Batman! Waldek on Holey Hatches Batman! Merhaba! We are Wayne and Christine and we would like to share our journey in building our extreme expedition passagemaker, Möbius. 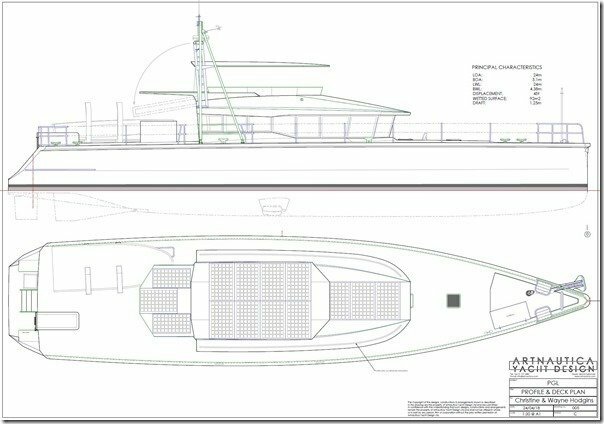 We are currently living in Antalya, Turkey where we are working with Artnautica Yacht Design (located in New Zealand) and GreeNaval Yachts here in the Antalya Free Zone to build our Goldilocks boat—that one which is just right for us.